Heading towards Daikanyama from Ebisu, there is a hidden shop in a quiet place. RUMHOLE selects secondhand clothing and brands which give off the sensation of subcultures such as movies as well as music and receives support from a wide range of groups which enjoy style. The exterior staircase which leads to the store on the 2nd floor is well-lit and spacious. However, as soon as you step foot into the store you are surrounded by a gothic mansion-like atmosphere. There are numerous paintings hung up on the walls and a number of chandeliers hang from the ceiling. Nevertheless, the items offered here are not all gothic fashion. 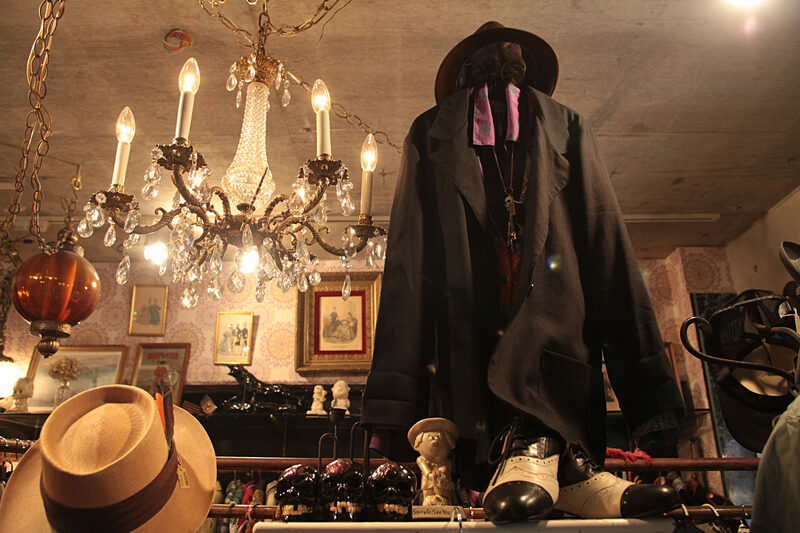 This store carries a mixed selection from pop-style attractive items to maturely stylish and horror items making this an incredibly unique shop. This shop is overflowing with originality in items such as many one-of-a-kind items which have been resized, re-shaped and even re-colored with dyes along with secondhand clothing and perfectly compatible original items. In addition, the number of hat varieties is especially remarkable. Sample torso outfits on display are all combined with headwear such as hats or berets to make full-out coordinated outfits. There are a number of scheduled exhibitions for all brands and their collaboration items in the future so check these out too!